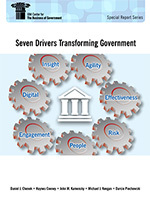 Based on our recent research and perspectives shared by current and former government leaders, this special report identifies seven drivers for transforming government in the years to come. In 2018, the IBM Center for The Business of Government marks its twentieth year of connecting research to practice in helping to improve government. The IBM Center continues to execute on its ultimate mission: to assist public sector executives and managers in addressing real world problems with practical ideas and original thinking to improve government. The Center supports leading researchers to identify trends, new ideas, and best practices—crafting actionable approaches that support government decision-makers in addressing mission delivery and management challenges, through strategies and actions that promote efficiency and effectiveness.